Small cars are nothing new. 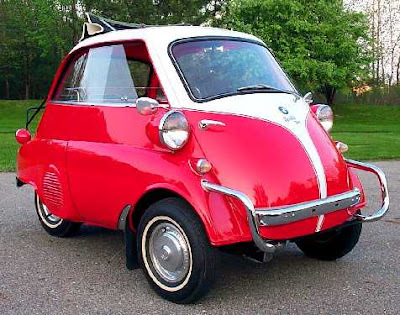 Case in point, the 1955-1961 BMW Isetta posted above. I ran across a club dedicated to vintage micro cars called, appropriately, the Vintage Micro Car Club (www.microcar.org). The club has a magazine, a "meets" section, forums, and a micro car list, and a links section—it's a very cool Web site. Whether you're into tiny BMWs, the unique Messerschmitts, or simply have an affinity for small cars (like me), check out this site.